The British Lung Foundation (BLF) is this week launching a campaign to promote awareness about the dangers of asbestos amongst tradespeople. According to official statistics, every week on average six electricians, four plumbers and eight joiners die in the UK from exposure to asbestos, making it the single greatest cause of work-related deaths. The ban on the use of asbestos was only imposed in 2000, so any building built or renovated before then might contain asbestos. The BLF’s Take 5 and Stay Alive campaign aims to ensure tradespeople have the knowledge to act safely and responsibly, ensuring they can identify asbestos and determine what type it is, and assess whether they have the training and equipment to deal with it safely. 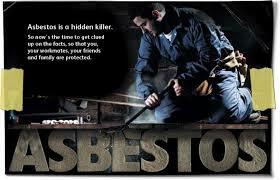 British Lung Foundation chief executive Dr Penny Woods said: “Twice as many people die from asbestos-related illnesses than on the roads each year in Britain. It’s the biggest work-related killer, and the numbers of deaths associated with it are rising each year. Sole traders and people working for small companies are often under particular pressure to take jobs and deliver quickly, and this can sometimes put them at particular risk of asbestos exposure. “But it’s not just tradespeople putting their own lives at risk. If asbestos is disturbed the particles can affect others too, and we know several women who have died after years of washing their husbands’ contaminated overalls.